I’m really impressed with the recent miniaturization of boards and components. Back in the days (in 2012), many people were amazed at the credit card size of the Raspberry Pi ARM Linux computer. Since then, we’ve seen many other ARM Linux board with similar or even smaller sizes, and on a broader scope, many smaller and smaller hardware and components: Olimex launched OLIMEXINO-85S Arduino compatible board about the size of a micro SD Card, eConais unveiled WiSmart EC19D Wi-Fi module measuring 8×8 mm, Freescale recently announced Kinetis KL03 Cortex M0+ MCU measuring 1.6 x 2.0 mm in its smallest package, etc… Today, I’ve come across another tiny chip, the world smallest magnetic field sensor by Alps Electric that measures only 1.15 x 1.15 x 0.56 mm. Height does matter too. 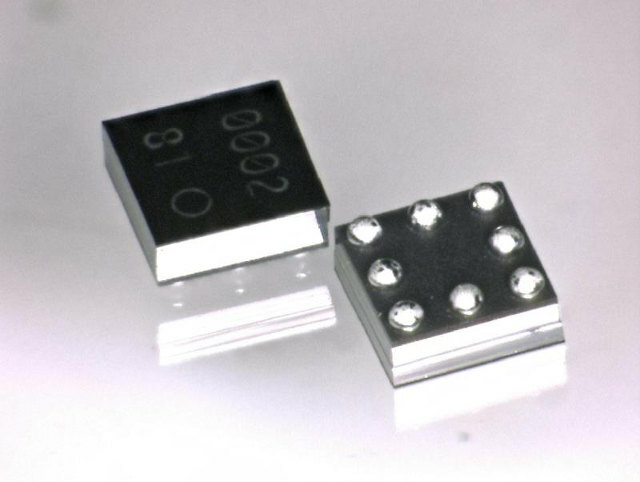 It’s about 60% smaller than previous product by the company, but only slightly smaller than Asahi Kasei Microdevices’ AK09911C which measures 1.2 x 1.2 x 0.5mm (0.57mm including solder balls). The measurement range of the new magnetic field sensor is ±4.9mT for each of the x, y and z axes, and output resolution is about 0.15μT. Its power supply voltage is 1.7-3.6V for both analog and digital parts. Beside its small size, this magnetometer can provide a gyroscope function thanks to a software algorithm that estimates angular velocities for the three axes. The company claims this removes the need for a gyro chip, cuts power consumption by 80 to 90%, as well as BoM cost. The downside is that the accuracy is lower than a gyroscope chip, which means it will be rather used in low end smartphones where a gyro is not always present. Samples will be available in the Q2 2014, mass production will begin this summer at a rate of two to three million units per month. The new sensor should eventually show up on Alps’ Magnetic Sensors page.